In this lesson I am going to explain what drop 2 voicings are, how to construct them and then how to practice drop 2 voicings so that you are familiar with them in all 12 keys. We’ll also talk about how you can spot opportunities to harmonise the melodies of Jazz Standards using drop 2 voicings and also look at ways that these voicings can be used to create movement over static harmonies and melodies. In the last lesson we introduced the 4 Way Close which is a simpler version of drop 2 and will help you understand the construction and application of the drop 2 voicings covered in this lesson. What is a drop 2 voicing? 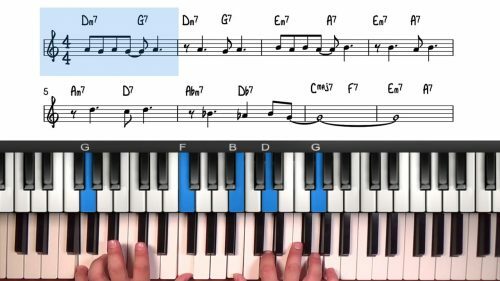 Drop 2 voicings can be heard in the recordings of almost all of the great jazz pianists and they are an extremely useful tool for harmonizing the melody of jazz standards. Drop 2 was originally used in arranging for orchestras and big bands as it provided a way for 4 horn instruments to produce a very rich texture over a single chord. We’re introduce some bigger voicings and cover some interesting examples of altered harmony and upper structure triads. Like Someone In Love is one of the great jazz standards. The tune is written in the key of Eb Major and follows a 32 measure A1 – B1 – A2 – B2 form. Duke Ellington’s ‘In A Sentimental Mood’ is one of the most recognisable jazz ballads. 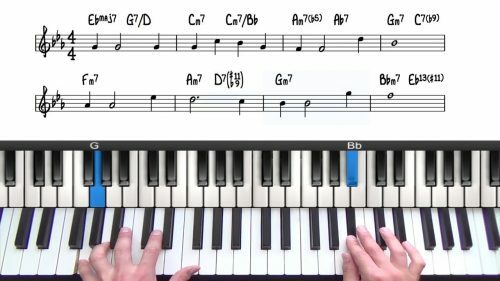 The tune is very accessible and a great for beginners. First of all, you need to find a section of a jazz standard that would be suitable for drop 2 harmonisation. 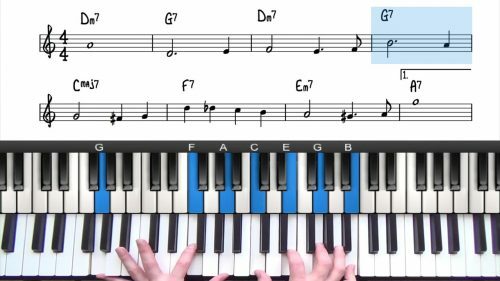 Flick through the standards you can play and look out for either stepwise melodic movement or sections of static harmonies and melodies. Once you have found a suitable application, make note of the chord and then play the four way close for the whole scale. For example, if you find a stepwise melody over F Major chord. Harmonise the F Major scale with the rootless dominant b9 chord so that you are familiar with the voicings. When you follow the process above you are learning these voicings in context, which is vitally important. At this stage, it's not essential that you can harmonise using drop 2 in all 12 keys. Just take a tune that you can already play and enhance your arrangements with drop 2 harmony.